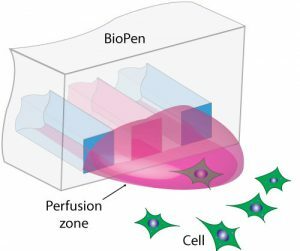 A novel approach for determining the viability of individual cells in an adherent cell culture was developed by using the BioPen (formerly the Multifunctional pipette), in combination with a multi-component fluorescent response assay. Through directed exposure of the target cells to a pore-forming agent, the membrane permeability was controlled, where the extent of poration depended heavily on the cell type and life-cycle. The cell viability was able to be assessed 60 s after the poration, by simultaneous exposure to fluorescein diacetate and propidium iodide solution. Viable and non-viable cells were distinguished by the fluorescence emission of the two dyes within 10 s of the application. Hundreds of cells from four different cell lines, NG108-15, HEK 293, PC12, and CHO, were investigated within two days. These results demonstrate that the BioPen system is a facile, rapid, and reliable means to determine the viability in single-cell experiments.